Hello! As of today’s update, Compiler Explorer now has its own storage solution for when you click “Share” and pick “Short” from the dropdown. We used to store all the state in the URL itself, then we used goo.gl to shorten it. When Stack Overflow banned goo.gl, we rewrote goo.gl URLs to be godbolt.org/g/blah, where blah was the bit from goo.gl. So, your data was still stored with Google. The limit on URL length which previously prevented some longer code snippets or more complex layouts from being shortened is now lifted. There’s no practical limit any more: though we might pragmatically have to put one in. The short link unfurling that happens when you paste a link into Slack, Discord, or Twitter is much improved. Compiler Explorer admins are now responsible for your data. We understand this is a huge responsibility and take it very seriously. We have a number of safeguards in place to keep everything as safe and secure as we can. If you have any issues with the new system please get in contact as soon as possible. You can email me, or tweet at me, or direct message me on the Cpplang Slack. Posted at 18:00:00 BST on 18th August 2018. It’s been oh-so-quiet here! I’ve been away on a long European holiday, visiting Iceland, United Kingdom, France and the Czech Republic. I’ve had a great time, but haven’t had as much time as I’d like otherwise to work on Compiler Explorer. 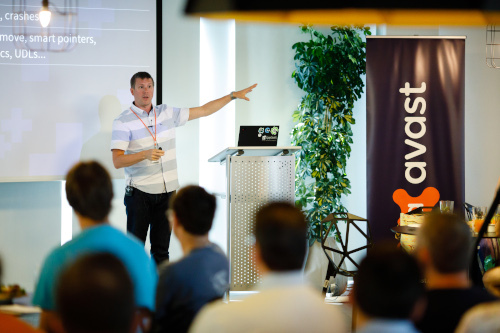 While in the Czech Republic, visiting the unimaginibly beautiful Prague, I was invited to speak at Avast, the anti-virus company. They have an amazing office and working environment: a music room (and studio), couches everywhere, great food, pinball machines, golf putting courses…you name it! Lovely folks too. In particular, huge thanks to Hana Dusíková for inviting me, and arranging everything and generally making it a pleasure to speak there. She’s now running a regular C++ meet up, which if you’re in Prague you should sign up for straight away! Posted at 00:00:00 BST on 16th July 2018. As I’ve mentioned previously, I’m currently on a break between jobs. With my copious spare time I decided – rather late in the day – to head to C++Now, a C++ Conference held yearly in Aspen, Colorado. Several C++ folks had recommended that I come to it: it’s a smaller and more intimate conference than CppCon. I was not disappointed! 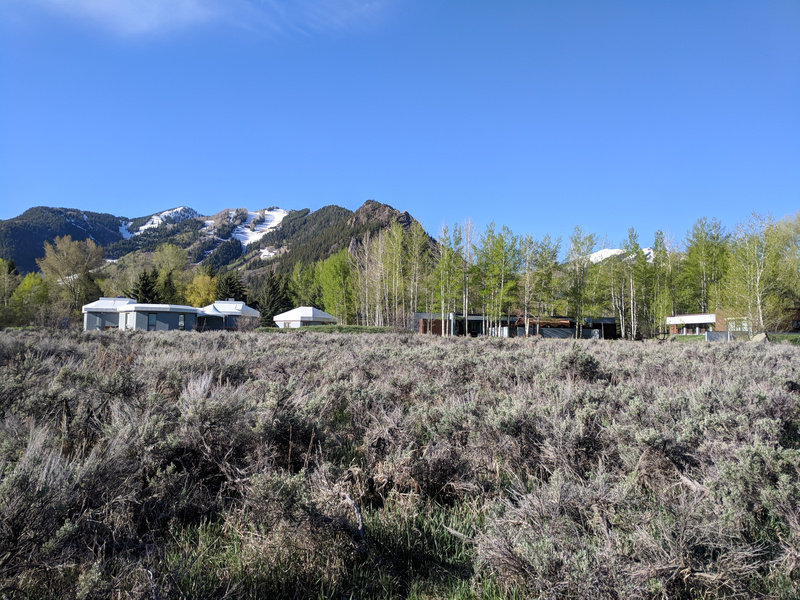 Firstly, Aspen is a beautiful place to hold a conference, although the thin air at 9,000 feet up takes a bit of getting used to. The conference rooms used for C++Now nestle in a beautiful meadow. Posted at 22:30:00 BST on 14th May 2018. Last week I took the momentous decision to wave goodbye to my friends and colleagues at DRW, and try something new. I had an amazing 7½ years at DRW, learning so much and making some firm friends. DRW is an excellent company to work for, and this was the longest job I’d ever had. That made the decision to leave extremely hard, but I felt it was time to try something new. I’m taking a few months off, and then I’m very excited to start work at Coinbase in the summer, where I will be working on making their exchange software even more awesome. I’ll be staying in the Chicago area, so disruption to my family is minimal. In the next few weeks I’ll be spending a lot of time with my wife and kids, but I also hope to use the time to work on Compiler Explorer and other open source projects. And finally complete Zelda: Breath of the Wild too! Posted at 16:30:00 BST on 19th April 2018. Compiler Explorer now has a logo! If you like it and want to support Compiler Explorer, I set up an online shop where you can create your own T shirts, bags, mugs and so on! By doing so you’re supporting Compiler Explorer’s development, as I get a small commission for any sales. Of course, it’s all open source, so you can make your own with the logo too! Posted at 23:50:00 GMT on 3rd March 2018. Almost on a whim, I’ve started re-recording some presentations I’ve done at work on a variety of programming topics, and have uploaded them to YouTube. I enjoy giving these presentations – you really have to know your topic to be able to effecitvely talk about it in front of people! I plan on recording more, and indeed creating new content just for YouTube. Meltdown & Spectre – the technical details behind the recent security issues found in most modern processors. Memory & Caches – a detailed explanation of how cache RAM and dynamic RAM work, how caches work, and some performance measurements showing how important it can be to understand memory access patterns. Five things you didn’t realise your CPU did for you – a lightning talk I gave at the Chicago Open Source Open Mic to give some grounding on some of the cool things your computer’s processor does behind the scenes. zindex – index your gzipped files – another OS:OM talk, this time about my zindex open source tool for indexing compressed text files. Posted at 19:00:00 GMT on 4th February 2018. Until last week I had never been to a C++ conference before. I’m rather glad to say that I’ve now experienced the wonder of having a firehose of C++ knowledge plugged into my brain and turned on. Most of the best times at the conference were in between talks, where random meetings in the hallways over coffee would yield fascinating discussions. I was flattered to have a fair number of people spot my name badge and come up and thank me for Compiler Explorer – a very surreal experience. I got a tiny taste of what it must be to be “famous”! I also got a lot of advice and ideas on how to improve the site, and once the dust settles a little I look forward to getting stuck into improvements, like more Microsoft compilers (and a better compilation experience for those using it), and execution support. Posted at 21:00:00 BST on 2nd October 2017. Compiler Explorer is now on Patreon! Today I launched Compiler Explorer on Patreon - a site where one can pledge ongoing donations to content creators. It was tougher decision than I expected. I spend a fair amount of cash and an awful lot of time on Compiler Explorer, but I’ve always seen it as a hobby. This now puts me a little closer to seeing it as a “job” of sorts. I hope this works out! If you enjoy using Compiler Explorer and want to help out, please visit the new page on Patreon. Posted at 04:00:00 GMT on 23rd January 2017.